Unfinished Game: Zem! for Bang! 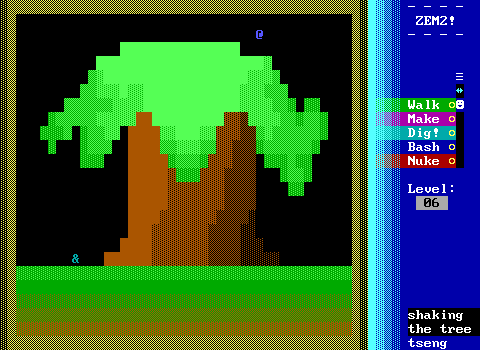 Around 2003, I was twenty and my friend ADV was developing a ZZT-inspired game creation system called Bang!. I had retired from ZZT a year before with the release of Zem! X, a final entry in a series of Lemmings-inspired games. At the time I was mostly focused on drawings and wasn’t especially interested in continuing game development, and certainly not in learning programming. While Bang!, heavily inspired by ZZT, used a language much like that system’s ZZT-OOP, it was much more powerful and, as you might guess, much more complex. While it retained a tile-based character system like ZZT’s, it allowed an infinite expansion of the character set and multi-colored characters, basically making sprites possible. Having primarily worked with text-mode systems, this was very appealing to me. But learning new programming somehow wasn’t. In early 2003, ADV agreed to do the programming work on a new project if I’d lead up design on a project and provide the art assets. I still had some game ideas I’d been itching to try. And so I began plans for a game based on Zem! X‘s lemming hunter concept, to be entitled simply Zem! At the time, I was enamored with the idea of open world games and Pokémon and wanted to add a bit of that grand scope to the project. Rather than the stage-by-stage challenge of Zem! 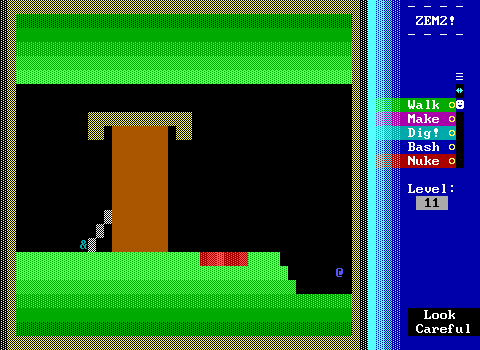 X in which the player had to shoot one lemming, Zem, in order to move onto the next level, this game would find the player (choosing from a dozen or so potential avatars) on a journey to advance through the ranks of the Zem Catching Agency, an organization that returned pet zems to their owners, captured zems in the wild to be sold as pets, and removed nuisance zems. As you can see, “lemmings” had been replaced by “zems,” though clearly their designs were still inspired by the critters in Lemmings. Beyond the standard, blue-clad zems who simply marched ever forward, there would be fire-breathing zems, flying angelic zems, giant cyclops zems, and even goth zems–just for starters. The game would have free-range areas where the player could hunt down rare or unique zems to raise in ranks or earn money as well as specific mission levels. Zem! was to have a massive world map that the player would need to expend resources to navigate by buying bus and plane tickets. There were to be major hub cities and little towns, belying my infatuation with Zelda 2. Somewhere in there, plans for online multiplayer modes were also sketched out, where players could compete or cooperate via peer-to-peer connections using the characters in their save files. There would be dozens of playable avatars. It perhaps goes without saying that plans for the game quickly became unruly. In truth, I both had a hard time managing the scale and flow of the game and I’m not sure that I ever had the clearest idea where it was all going except for some vague vision. Eventually, WiL (who was already planning to provide music for the project) took over programming, but even still the game lacked direction on my end, I hit a block, and, as a result, the project was abandoned. Basically, the scope got out of control, my ambition couldn’t match by then-ability as a game director, and it was unsustainable. ADV eventually discontinued Bang! and began working on his next ZZT-inspired game creawtion system, Plastic, which attracted an even bigger following, if I remember correctly. WiL made some awesome stuff for it. I think I flirted with getting involved with Plastic, but never produced anything. In the meantime, WiL, Brian Polak, and I made Tetrovny! in Bang! (we were all really into exclamation points in titles in those days, it seems). WiL made a handful of really neat Bang! games, continuing his innovative and boundary-pushing work in ZZT. A few months ago, I uncovered some of my old notes, old art assets, and some old builds that I could still get running (forgive the sophomoric humor and drug references–we were young). I took a couple videos of the game at different stages. The first includes the opening cinematic sequence as well as a city environment and the game’s menu. The second is a demonstration of the game’s weapons and different zem types. I can’t believe I thought that tile-based parallax scrolling underground was going to be at all acceptable. And finally, I’ve dug up a video captured by YouTube user JaqMs of a build of the game I don’t have in my archives. I’ve occasionally thought about revisiting this project–or at least the concept–and adapting it to Game Maker. After primary design work was done on Caverns of Khron I actually began a Game Maker version, recycling much of the assets from the Bang! version, but it again suffered from lack of a clear direction, and it stalled out before I got as far as programming the tranquilizers. Meanwhile, the basic ideas explored here and in other games of the Zem! series have heavily inspired my games Penguin Mania X, Super Stone Ball, Shadow Wrangler, and the upcoming Explobers. NOTE: If you’re looking for Bang! itself, I have the most recent release (1.1c) I had available for download here. It’s an old program now and originally came with an installer, so I can’t guarantee how well these files will work. I know someone wrote some documentation for how to use it, but I can’t find it anywhere. I may try to upload whatever games I can locate on my hard drives that were actually released, though most of what I have is my own and others’ in-progress builds.